Eat, Run, Read: The Weekend Report : King Tut - Pretty Freaking Sweet! The Weekend Report : King Tut - Pretty Freaking Sweet! So happy Tuesday! Here I am. Slightly more alive today than yesterday (but only slightly - my alarm went off this morning, and I'm pretty sure I told it to shut up. Out loud. It didn't listen). My last weekend in CA was pretty low-key. The fam went to see the King Tut exhibit at the DeYoung in SF on Saturday morning. It was pretty cool. When I say “pretty cool,” I actually mean really cool! For some inexplicable reason, I am really into Ancient Egypt. Once a week in elementary school we had Library Day. Everyone went for a half-hour and checked out a book. And seriously every week it was a race to get the Eyewittness Mummy book. Because it was the COOLEST BOOK EVER. 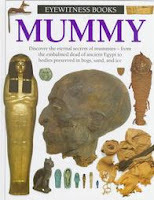 There were pages on frozen mummies, Egyptian mummies, and pictures of all the gory details. Like how they used a hook to pull the brains out through the dead person’s nose! COOL! Then for the 8th Grade Science Fair, a friend and I mummified a duck for our project (the legitimacy of this as a science project is questionable…but whatever, we got an A). We went to an Asian grocery store, bought a duck with a head and feet and everything, then proceeded to dry it out by covering it in salt in my parents’ wine-cellar over the course of a couple months (my family doesn’t drink, so this nice cool little basement room was always empty). Looking back on it, I guess that’s kind of weird…BUT kind of cool at the same time. And then Egypt resurfaced recently when I went to the Met in NYC. They have rooms full of awesome sarcophagus and mummies and all that stuff! And I was surprised how into it I was, because usually ancient artifacts are not my thing at all (ceramics? booorrring!). 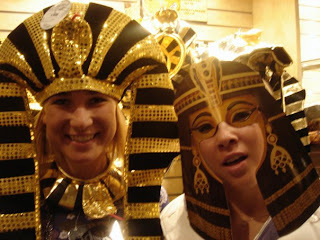 And back in CA, my mama insisted we see the King Tut exhibit as a necessary cultural experience. "Our goal with this exhibition is to present the beauty, artistry and rarity of the 130 objects from Tut’s tomb and the tombs of his royal ancestors and to share with visitors a comprehensive and educational look at life during the 18th Dynasty, Egypt’s Golden Age. Since it is likely that these objects will not travel again once the new museum in Giza opens, this exhibition presents a unique opportunity to see these wonderful artifacts in person." Conclusion? Go. I think it's worth it. 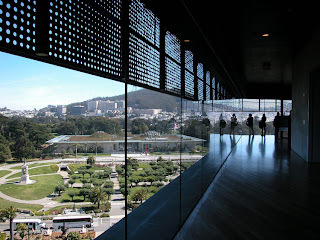 And while you're there, PLEASE check out the rest of the DeYoung. Especially the tower (which is free to go up even without a museum ticket) - if you're in the SF area and haven't been up the tower yet, do yourself a favor and DO SO NOW. Thank you. Have a great Tuesday, and look forward to some cake tomorrow!